The choice of cover crop depends on the main benefit you are hoping to obtain from the cover crop. A primary benefit in a garden is the addition of nitrogen, in which case legumes would be used. Fava beans are frequently used, but nurseries also sell cover crop mixes geared to soil type and future planting goals. 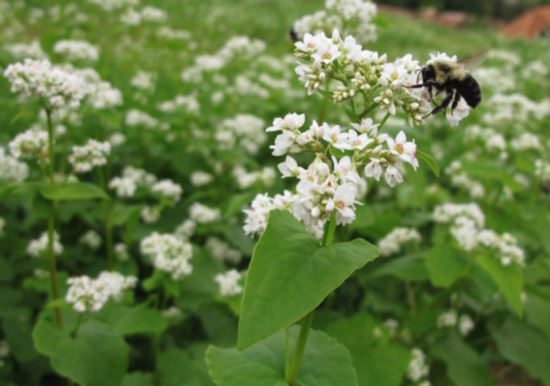 Check with your local nursery to see if they such mixes, or shop for a soil builder cover crop mix online. Legumes work in harmony with bacteria that lives on their roots. These bacteria take nitrogen from the air and fix it in pink root nodules, adding nitrogen to the soil in a form that plants can absorb. In order to ensure good nitrogen fixation by the legume, it is necessary to inoculate the legume with the proper strains of bacteria prior to planting the legume seeds. This inoculation can easily be done at home through the purchase of an inoculant, usual bought at the same place where you buy your cover crop seeds. Once seeds are inoculated, they should be planted immediately. The legumes germinate rapidly and require little maintenance during the winter. The best time to till in your cover crop is when 50% of the flowers are in bloom. Following tilling, the cover crop will decompose, and soil microbes will return nitrogen and other elements to the soil for the next crop. It is best to cut the cover crop in small pieces (i.e., shred) the cover crop, so it will break down faster. Once the cover crop is shredded it is important to till the cover crop into the soil as quickly as possible. The cover crop will lose nitrogen and carbon very rapidly if left exposed in the sun. The breakdown process will take 2 – 3 weeks. The Mill Valley master gardener chose a “Premium Soil Builder mix cover crop” and purchased the right strain of inoculant to coat the seeds before planting. This mix fixed the nitrogen that was depleted from her previous year’s garden and also added organic matter to the soil for her spring garden. In addition, the cover crop provided an excellent habitat for beneficial insects. The mix contained bell beans, BioMaster peas, Dunsdale peas, purple vetch, hairy vetch, common vetch and Cayuse oats. She reports that her soil was very healthy this year without diseases or pests, and her summer garden was highly productive. Download the handout on Cover Cropping from UCCE Agriculture & Natural Resources.